The agency denied any link between the postponement and a recent weekly magazine report of a financial dispute — between Komuro’s mother and her former fiance — over her son’s education expenses of about ¥4 million, which were reportedly shouldered by the mother’s former partner. “The intention of the two to get married hasn’t changed at all. (The postponement) isn’t because of the report,” said Takaharu Kaji, an Imperial Household Agency official. Another senior agency official said the postponement should be seen in a positive way. “If there is any trouble, it should be resolved, and then the two should get married. Time can be used to further strengthen their bonds,” the official said. The princess said in a statement that she has reported the postponement to the Emperor and Empress Michiko, who have shown respect for the decision. “I wish to think about marriage more deeply and concretely and give sufficient time to prepare our marriage and for after the marriage,” she added. The princess said she wants to postpone the marriage and other related events until 2020, after a “series of ceremonies important for the Imperial family have ended smoothly.” That is an apparent reference to the Emperor’s planned abdication on April 30, 2019, and the accession to the throne the following day by Crown Prince Naruhito. She added that the delay was caused by the couple’s “immaturity” and that they regret the situation. “We feel extremely sorry for causing great trouble and further burden to those who have willingly supported us,” she said. Komuro lives with his mother and grandfather in Yokohama. He met the princess at university and currently works as a paralegal at a law firm in the capital, where he attends Hitotsubashi University’s graduate school at night to study business law. The agency had formally announced the planned engagement of the couple last September, confirming earlier news reports. The princess will renounce her status as a member of the Imperial family after marrying the commoner, in accordance with the Imperial House Law. The princess and Komuro met at International Christian University in western Tokyo. They became close in 2012 when they participated in an orientation session for study abroad programs, the princess has said. As a part of the exchange program, the princess studied at the University of Edinburgh while Komuro attended the University of California, Los Angeles. Komuro has said the pair started dating before they went abroad. Komuro said he proposed in December 2013. After graduating from ICU in 2014, the princess earned a master’s degree in art museum and gallery studies at the University of Leicester in England. She is now a researcher at a museum at the University of Tokyo. 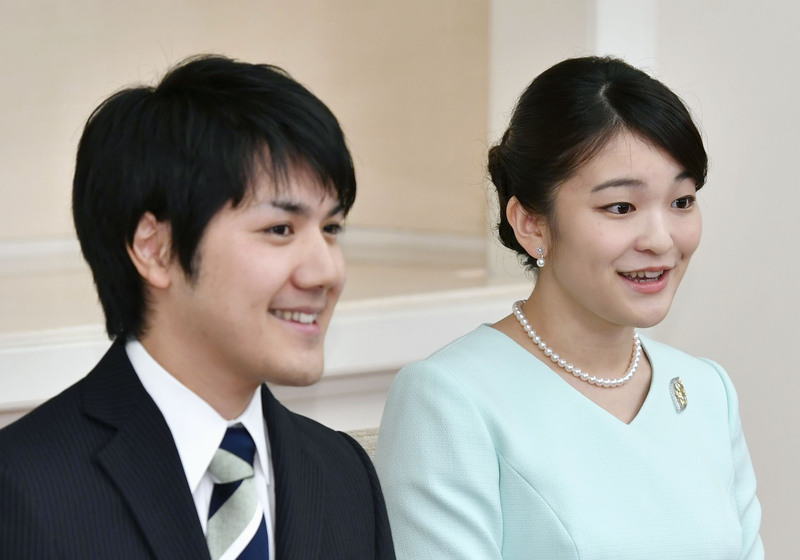 The princess is the first of the Imperial Couple’s four grandchildren to get engaged. The engagement has highlighted the dwindling size of the Imperial family. Under the Imperial House Law, princesses can’t become reigning empresses and are obliged to leave the family upon marrying commoners. When she gets married, it will reduce the Imperial family to 18 members, including the Emperor himself. Only a male in the paternal line has the right to ascend the Chrysanthemum Throne.